Located in the northwest of Cambodia, Siem Reap is a fast growing tourist hub that has progressed victoriously from its rich cultural and violent political history. With numerous temples, vibrant bio diversities and lots of exciting activities to do, the place is an exhilarating tourist destination for luxurious holidays as well as budget-friendly vacations. Siem Reap is also called a foodie’s haven because of the numerous experimental cuisines available all over the city. You will also find a number of local food stalls around Angkor Wat that caters especially to tourists who come to visit the temples. The Khmer culinary traditions showcase plenty of French influences. For some reason, Cambodian cuisine is extraordinarily underrated and does not get the recognition that other culinary havens do. But once you try it, you will not be disappointed. So if you are on a food adventure in this buzzing village, here are some of the best places to eat in Siem Reap. 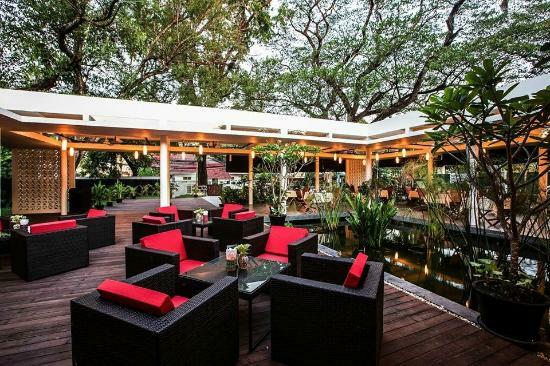 The Chanrey Tree is a posh dining area in the little province that offers traditional Khmer cuisine in a modern and lush setting. It is located beside the river in the middle of Siem Reap. The Chanrey Tree provides a combination of traditional Khmer ingredients that are available only seasonally within the lavishly green surroundings and relaxed ambience. Chanrey Tree’s fresh spring rolls are one of the best in the town. It is wrapped in lettuce leaves or delicate rice paper with minced pork, rice noodles, river shrimp, cucumber, chicken, chive and Khmer herbs served with peanut dressing. This dish is clean, fresh and will elevate your taste buds to another level. The crispy rice crackers are a traditional starter which has become a staple classic for all young and old people. It is combined with a creamy and flavorful Natang sauce filled with meat of choice and cooked in coconut milk and served with peanut sauce. It is a fantastic combination of rich creamy flavor and mouth-watering aroma. For a refreshing salad dish, try out the chicken salad in Khmer dressing with peanuts, banana blossom, and herbs. You can relish on Baked Goby Fish which is a Goby river fish marinated with lemongrass and garlic and baked in salty crust along with some chilies and savory mango dip. Named after the Moring tree which is also called the “Tree of Life,” the Marum Restaurant is in a cozy wooden house with a green outdoors. They serve a delightful mix of local cuisine in the most enticing way. Your visit will not only give you an incredible dining experience but the place also helps contribute to support the life of the training students there! Part of the Tree Alliance group of training restaurants, they provide vocations into the hospitality industry for local street kids and disadvantaged youths. The place is managed by the head chef who works for the welfare of the street children in different areas of Siem Reap. By combining delightful quality cuisine and a busy training school, Marum is exceptional with regards to price point, taste, and ambiance. You can also try the unusual red tree ants. This unique delicacy stir-fried with lemongrass and beef is also something that attracts a lot of tourists. It has a light spicy taste with a tangy finish. Just the thought of eating red ants makes the experience a unique and memorable one. The best-selling dish here is the Bang Kang river lobster. It is marinated in a chili paste and the authentic Cambodian Prahok. The golden fish is served with jasmine rice after it has been wrapped in foil and grilled for an intense flavor. You can also try other dishes such as the prawn cracker with smoked fish and green mango salsa, or the shitake with local grilled fish. Another recipe that is worth a try is the steamed garlic prawns with soy and coriander butter that is full of warm flavors. Restaurant Café Indochine is one of Siem Reap’s longest-running restaurants that have been bringing quality tourism experience and exceptional hospitality. The café started in 2015 and continues to serve royal Khmer cuisine in a romantic and serene ambience. Set in a traditional Khmer wooden house, Café Indochine is located in downtown Siem Reap which was once the Angkor headquarters of UNESCO. It provides hearty Italian pasta dishes, exquisite Cambodian dish with French-style salads, and an international Steak House that is bound to melt your taste buds. The steak comes from the best local beef fillet served with a variety of sauces, cheese, and fine wine. 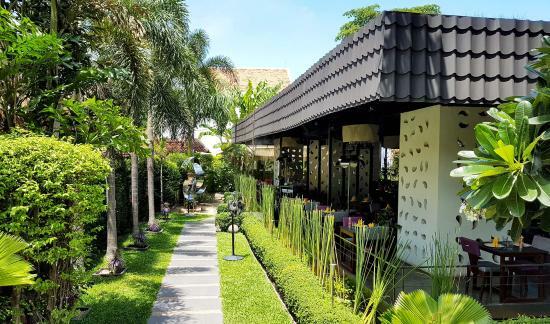 One of Siem Reap’s newest Khmer fine dining restaurants, Malis provides a sublime location to enjoy some of the most exquisite local cuisines in town. It is famous for seasonal ingredients, generous service, and mild flavors. The head Chef and his team have dedicated their experience to bring back the humble yet satisfying flavours of the past and make it work in the present so adapt towards a future. Signature Dishes of Malis is a crispy fried noodle with sliced pan-fried pork called the royal Mak Mee. It is marinated in Kroen sauce and aromatic lemongrass and simmered in coconut milk over a slow heat. And, the Moringa Soup which is a combination of nutritious Moringa leaf and pumpkin flower in richly flavoured stock. It is significantly consumed for medical purposes. You can also try the smoked local fish with tangy green mango salad for only $8. It is a seasonal fruit salad with dried and smoked local fish to bring out a flavor that is savory, fresh and crisp to taste. The Chreav duck is also something that will enthrall your palates. It is an authentic Siem Reap cuisine where a local duck is soaked in lemongrass and herbs, slow roasted and served with aromatic red rice. This newly built Cambodian culinary hot spot overlooks the Siem Reap River. The Yellow Mango Café is an excellent place to try some of the classical Cambodian gourmet cuisines or having a drink after a long day of visiting the temples. They serve a variety of Khmer originals along with some western favorites. Situated in a spacious and modern setting, it also has an open outdoor garden and patio. It features a refreshing place to enjoy their delightful, unique treats. The Roasted Semi-Wild Chicken is something that families and tourists come here to eat. It is a dish that envelops around the local chicken. It is marinated with spices and palm sugar, domestic seasoning oil, garlic, and chilies. It is roasted in traditional fire oven and served with a variety of sauces you can choose from. Red crabs are common delicacies in the old market. The best way to have them is at this restaurant where they serve rock crabs in red curry. The Kampot crabs are handpicked and boiled in a crab broth with coconut milk, red spices and chilies. It is presented with rice and choice of vegetables. It has a beautiful blend of meatiness and the delicious sticky rice is perfect for satisfying all hunger pangs. The Brewpub is the Province’s first well-established microbrewery that features a relaxing bar and restaurant in the heart of the quaint town. You can enjoy both Khmer and western classics in a lively atmosphere and binge on their five uniquely produced beers using the most excellent craft yeast. You will be pleased to taste the best brews from places like New Zealand, Hops from Australia, Malt from Germany, and Clean Local Water. They serve local Cambodian and European fast food that goes well with the variety of drinks that they serve. If you have never tried beer cocktails, this is the place to be! The fish and chips are flavored with local herbs and spices that add a twist to the conventional snack. The location is affordable, clean and relaxed. Another dish you must try at this place is the Kor Kour Soup with chicken curry in coconut cream and served with rice. It comes with a blend of green salads to balance out the rich, spicy flavors. Situated only a 5-minute away from the bustling Pub Street, and set in the modern and contemporary surrounding, the Square 24 is a place for the hip food enthusiast. The area offers a variety of Khmer cuisine. You will also get some of the all-time favorite western dishes to satisfy your cravings. 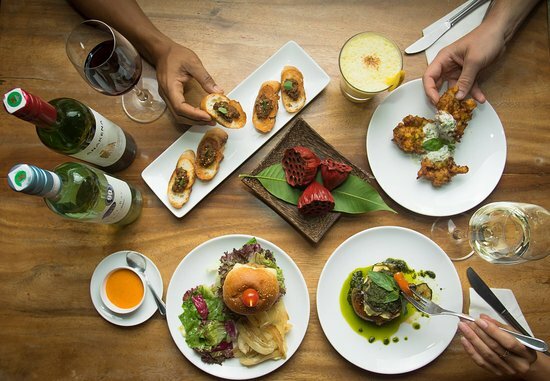 With a large selection of cocktails and wines, this restaurant provides a beautiful ambiance for quiet dining or fun parties in a chic location while giving you a plethora of genuinely incredible food. The beef salad, grilled fish and chicken Satay skewers are some of the snacks that customers often recommend. The main dish menu includes all types of Asian dish with excellent service and beautiful presentation. If you want to try vegetarian dishes, this is the one stop shop for everything vegetarian. Supporting an eco-friendly vegetarian lifestyle, the place has its organic vegetable garden around the wooden restaurant. The conventional wooden house setting of this restaurant makes it romantic and charming area to enjoy exquisite food with close friends and families. The menu is composed of locally produced food to create unique dishes with a fusion of international cuisine. You must try the vegetable Amok that is unique to this place and the variety of zesty fruit and vegetable shakes. This place will have your appetite satisfied for days while making you feel healthier and refreshed. Another dish that is worth trying in this place is the stir-fried frog legs with Angkor stout reduction, stem seeds, and lotus roots. The bold stout reduction adds flavors to the plate of vegetables. If you are not very fond of eating your vegetables, this is the way to do it! Craving for some homemade ice cream or need to satisfy your sweet tooth? Blue Pumpkin is a great spot to let you enjoy unique desserts and pastries that are locally made and western-inspired. Blue Pumpkin was initially a bakery in 2000 but have is now known for their specialized ice-creams and gelatos. It offers a soothing and relaxed ambiance after a long day’s trip around the place during the day. The atmosphere is serene, the seating is comfortable, and the staffs are friendly. This restaurant offers a variety of traditional Cambodian dishes such as the world-famous Fusili Gorgonzola, Tiramisu, Cambodian noodle soup called Kuthiewand much more. To top the list is the Cuisine Wat Damnak by Chef Joannes Riviere. 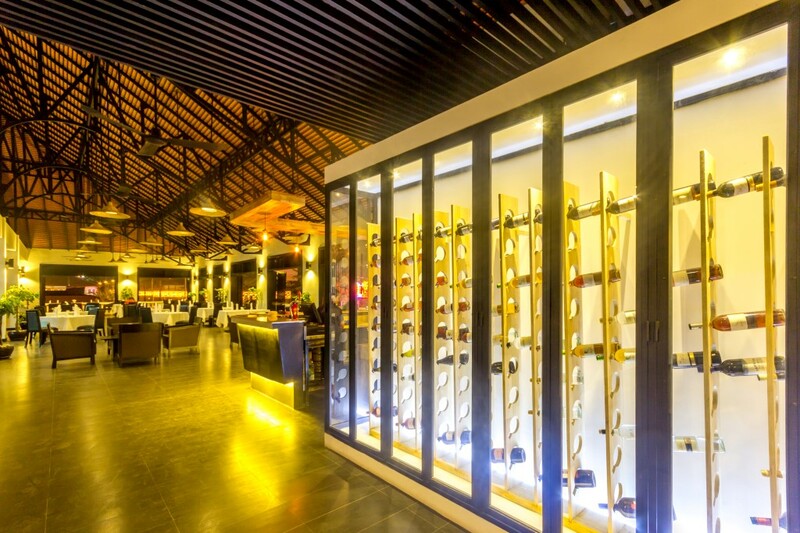 It is the first Cambodian restaurant to rank in 50 Best and Restaurant list in Asia. The Khmer delicacies served in this restaurant are prepared according to the French haute-cuisine principles. This blend of culture gives it a unique combination of Eastern and Western taste to create relishing menus that change every fortnight. The menu delivers the ultimate contemporary Khmer dining experience amid Wat Damnak Village. The restaurant has three separate dining rooms which include an air-conditioned room, a traditional wooden house, and a tropical garden. Cuisine Wat Damnak serves two separate menus every night and their menus change every week. The staffs go to great lengths to find ingredients in the local markets. When the components or choice of meat are not available in the market or they are out of season, they go outsourcing in the fields and forest to incorporate them in the menus. The place does not serve traditional Khmer cuisine. Instead, you will be treated to undistinguished dishes that you have never tasted before. Delicacy such as Mam which is a fermented fish paste cooked in banana leaf has an unusual succulent flavor. It is a combination of salty and savory flavors and is best enjoyed with eggs or minced pork. It also goes well with local edible flowers, herbs, and vegetables dipped in vinegar. ConclusionWhere ever you decide to go, be sure to try the traditional beef stir fry called the Lok Lak, the fish Amok in spiced curry and the Khmer red coconut curry. Some of the other places where you can find a delicious rendition of these “must-eat” food are Khmer Kitchen, Viroth’s and Sugar Plum. And also, don’t forget to taste the food served on the way to the temples. They are the most authentic and delectable food with fresh components prepared especially to entice tourists. They are quick, delicious and definitely worth the price!